Dusit Thani Pattaya joined the nation in honoring the memory of His Majesty the late King Bhumibol Adulyadej by planting yellow marigolds in the hotel’s sprawling gardens. The move was in response to the government’s call to grow marigolds or other yellow flowers as yellow represents Monday, when King Bhumibol was born. Flowers planted now are expected to bloom by October 20th, in time for the royal cremation from October 25th – 29th. 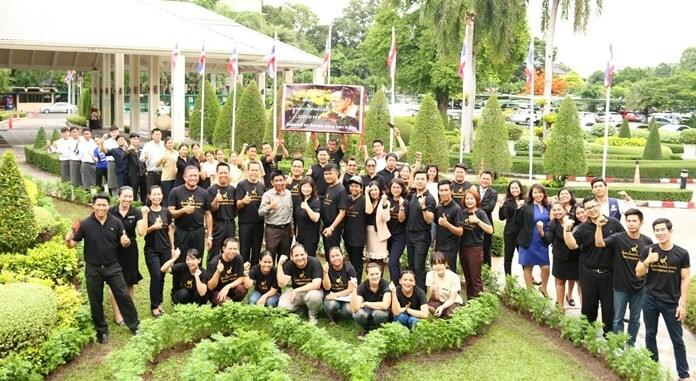 General Manager Neoh Kean Boon (standing, first row 5th left) is seen with the staff and management after completing the noble activity held in the gardens outside the hotel lobby.